Germany with its capital Berlin is located in Europe (Central Europe, bordering the Baltic Sea and the North Sea). It covers some 357,023 square kilometers (three times the size of Pennsylvania) with a population of 80,594,000. 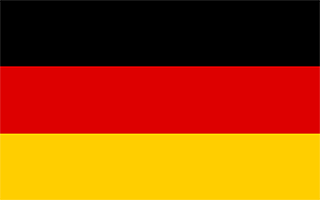 German is the official language spoken by people in Germany. Austria, Belgium, Czechia, Denmark, France, Luxembourg, Netherlands, Poland and Switzerland are bordering countries. Germany is the largest country in Central Europe. Germany is a federation of 16 states, each with its own distinct and unique culture. If you have perceptions of Germany as homogeneous, it will surprise you with its regions and diversity. Germany is an economic powerhouse. It has the largest population and biggest economy in Europe. Germany offers virtually every activity you can imagine - due to the federal structure every region has its own specific activities. Most Germans are members of a sports club and visit cultural events less often. Due to its size and location in central Europe, Germany boasts a large variety of different landscapes, offering many activities related to nature, from hiking in the forests to exploring the picturesque islands off the northern coasts! Deutsche Zentrale fuer Tourismus e.V. The topography is lowlands in north, uplands in center, Bavarian Alps in south. The average density of population is about 226 per km². The climate in Germany can be described as temperate and marinecool, cloudy, wet winters and summers, occasional warm mountain (foehn) wind. Potential natural disasters are flooding. To reach someone Germany dial +49 prior to a number. The local cellular networks are operated on 900 MHz, 1800 MHz, 3G, 4G. Websites typically end with the top level domain ".de". If you want to bring electric appliances (e.g. battery chaarger), keep in min the local 230 V - 50 Hz (plugs: C, F). The sign for the locally used currency Euro is EUR. Three equal horizontal bands of black (top), red, and gold; these colors have played an important role in German history and can be traced back to the medieval banner of the Holy Roman Emperor - a black eagle with red claws and beak on a gold field.